This study is for the studio painting, Copper Pot. I like to work out the preliminary drawing in line and value before the commitment to the painting. Searching out the composition and subtle relationships between forms, for me is the real key to any successful work. Even if that sketch is not a full finished image just simply a contour drawing, it is the ground work on which I like to work. 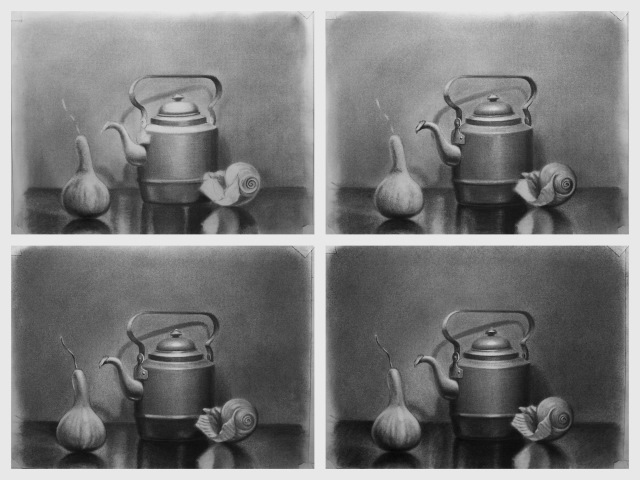 In this image, the copper, shell and gourd tones and palette are so delicate that I decide to work out a full charcoal value study for this painting. Charcoal is a wonderful medium, very painterly in its feel. It can produce very fine lines as well as tone, it produces a wide range of values very quickly, achieves very dark blacks, corrects easily when understood, can be very loose and spontaneous to detailed and controlled. My drawing process is a very traditional approach, with small variations that are convenient to me. The materials I used are very basic and for the majority of the drawing they are, a sandpaper sharpening board, (used to shape the vine charcoal to a fine point), soft vine charcoal, blending stumps and tortillions, kneaded eraser, tissue or a small chamois cloth. Also, charcoal pencils 4B and 6B mainly for the block out and contour and Strathmore 300 series charcoal paper. Plotting the drawing and blocking out. To scale the drawing you need a measuring device, something you can move your thumb up and down and make visual measurements from quickly, for comparison. You can use a piece of charcoal or a brush handle works. I like chop sticks as they have a uniform thickness up to the point. In the rest of this demonstration I will be referring to this device as your “scale”. After setting up the still life and establishing a viewing point (the spot you will use to make all your observation from), establish a vertical axis through the composition. Use a plump line or scale edge held at arms length. I placed mine at the edge of the bell shape of the teapot lid as reference. Along that line, plot the high points and low points of objects. Moving the thumb up and down its length to get the distance I want and make a tick mark with charcoal on the paper. Next establish some basic widths with the scale at arms length and mark the distance between points. Compare measure and develop a set of points you can use as constant reference, establishing one measurement that you compare the next measurement to and so on, growing a set of ratios. As you develop the drawing you will check your dimensions often. After plotting all your reference points block out the basic shapes with simple straight lines. Keeping it as uncomplicated as possible, keeping them simple makes it easier to rearrange them until you have their placement correct. With the image plotted and block out you have already established a rough contour of the composition. Refine the drawing by looking for the variations in and character of each line. Working each contour from simple to complex and rechecking their positions with your plotted points and landmarks. Continue refining and measuring against your scale. Continue checking vertical relationships, horizontal relationships, direction and angles using the ratios you have already establish. At this stage I have a very accurate line drawing based on relationships, actually drawing what I see, not what I think I see. For some this may seem some what mechanical, but as you work through a drawing this way it does become more conceptual and automatic. I would say it took me more time to explain these steps in text than to actually do them. To begin building values or modeling stage I tone the entire paper with charcoal. One can either use the side of a piece of soft charcoal or powder charcoal and level out the value with a chamois or tissue. Avoid using your fingertips, they can transfer oil to the paper and as you layer the charcoal cause areas that will not take more charcoal. Use a stump if you feel you need the control. As far as charcoal powder you can purchase it, however you will sharpen the charcoal sticks and pencils with the sanding board and create powder. I do my sharpening over a small tray made out of card stock and tape; dump the unused portion into a small jar and save it for the next piece. In toning the paper I want a single value, about mid way on the value scale. Every shape will be questioned by my scale (chopstick measurement) and its position related to the value scale. Ten being the lightest and zero the darkest. 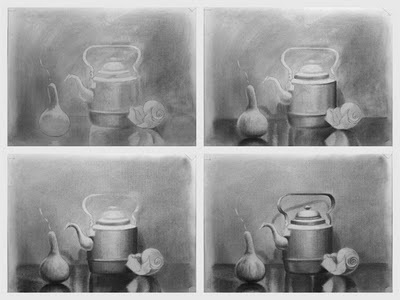 Next I state the light pattern by lifting out with a kneaded eraser and suggest the shadow pattern with more charcoal. At this stage all of the drawing is covered with some value on which I can start analyzing values and comparing masses. Develop the drawing thinking shape and value not line. Blend and soften the gradations of value. The kneaded eraser is great for this, roll it to a point and stipple and lift. Add more charcoal and blend with a stump. At this point all the passages become a add and subtract, back and forth approach of making minor adjustments. Next model the halftones, those values related to the light family (those values where a form is in line with the source of light). In a broad way you have already stated or massed these in but need to refine them. We must take a long look at these values for they are often the most descriptive and most subtle. How fast or slow (long or short) they progress will depend on the object. Again return to our scale and judge these. I made a handful of passages over the drawing at this point working over the surface and adjusting the halftones in small veils of charcoal. Next I made any contrast adjustments by looking at the dark family (those values where a form is not in line with the source of light). Again in a broad way you have already massed these in but just need to tweak them a bit. You might realize that at this phase almost all the information one needs to produce an image is in the simple analysis of form, objectively looking at masses and relating them to one another and that very little detail is really required to create form and dimension. The final stage of the drawing is looking at the subtleties of our contour, those areas that are lost and found edges (hard or soft) being certain that they help describe the form. I look at the highlights which is the white of the paper and adjust it. I look at all the reflective lights and when I think they help describe the form I call the study complete. You could certainly push this work further, continue refining and adjusting. But as far as a study for a work on canvas, I have a great resource and a better understanding to go foreword with. This process is a lot easier to complete than read about; I hope I’ve been able to describe it well enough. I produced a video of the process that for some maybe more instructive. Sorry about the poor audio quality on the video, visit The Avett Brothers site and click listen now to hear the great music by these artists. Hope this has been of some interest, anyway, on to the painting. This is a great posting and very helpful. Gorgeous work as well. Hey I really enjoyed the step by step on this!!! thanks. Anne, so glad you found it interesting, thanks for looking. Brain, I am familiar with your work, what great skills and talent. Your blog has just fantastic demos.